Umeå/Stockholm -- The 1st Nordic Rainbow History & Arts Month -- October, 2016 -- has been launched in the northern Swedish city of Umeå October 1and 2, in the last two days of their annual Pride there -- with seminars, discussions, films, art and photography. 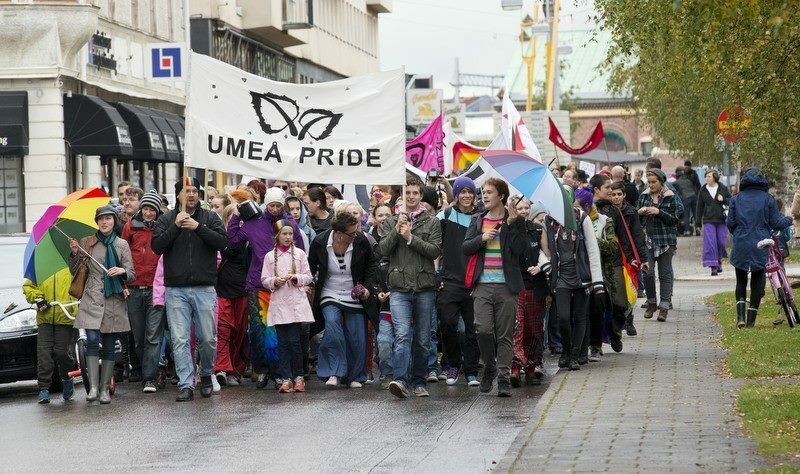 "This was a great feeling for Umeå Pride to have launched this historical month," says Umeå Pride project leader Mio of Queerförvaltningen, the main Pride organizer. "Making LGBT questions more visible is more important than ever with the right-wing winds blowing everywhere around us!" "The participants of this segment of this pioneering Nordic month have made history," Bill Schiller of Tupilak (Nordic rainbow culture workers) and the ILGCN (rainbow culture international) told a cheering crowd from the Pride Park stage after the Pride parade marched through the city streets. He jokingly added: "We may be a bit slow sometimes in the Nordic zone -- perhaps because of the cold, northerly climate -- but we have finally caught up with LGBT-history month organizing colleagues in Budapest, Edinburgh, London and other southern cities." "Instead of limiting the event only to the capital city, the Nordic rainbow month follows the Umeå events by continuing in Stockholm and will end the month with the last three days in the Lithuanian capital of Vilnius -- since we regard our Baltic neighbors as solid members of the Nordic family," Schiller adds. 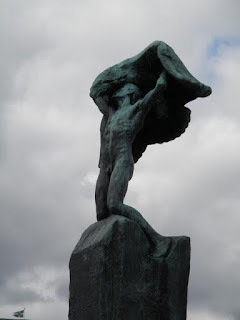 "This month is a long-overdue focus on the history and art of the vast Nordic region -- stretching from the coast of North America in the West and to the borders of Russia and Belarus in the East." One aim is to use rainbow culture and the history as powerful weapons in the battle against the invisibility and discrimination of those with HIV/AIDS, those with different abilities, trans, the youth, elderly, and refugees from such nations as Kurdistan, Iran, Kazakhstan, Kyrgyzstan, Belarus, Russia, Uganda. The Stockholm stage will also include the 1st Tupilak Art Fair, the birth of the 1st Nordic Rainbow Network (reviving the long-ago deceased Nordic Homo Council but this time also including Estonia, Latvia and Lithuania), stage 2 of the ILGCN World Rainbow Culture Conference 2016 (between stage 1 in Palanga, Lithuania last July and stage 1 of 2017 in Budapest, Hungary), a Stockholm meeting of the European Rainbow Humanists, a Nordic session of Bears International and a Nordic fund-supported travelling exhibition on the devastating consequences of prostitution, "Lilies of the Streets," and a photo exhibit from the international Association of Anti-Fascists. "As a 0-budget event, we are very dependent on the generosity of rent-free locales in Stockholm offered by Nordic Association - Stockholm, PositHIVagruppen, Sidetrack pub, Secret Garden pub and the Folklore Centrum and such NGO organizations as the Central Asia Group, Civil Rights Defenders, as well as representatives from Swedish Amnesty Press, the Rainbow Library -- Umeå, the Canadian Embassy and the British Council," concludes Schiller. "In Vilnius, we are very pleased to have co-operation with colleagues in the national Lithuanian LGBT organization LGL and cultural workers in Vilnius for October 29-31, the closing days of this Nordic rainbow history month, " says Schiller. "One of our aims in Vilnius is to include colleagues from neighboring Belarus -- eager for international contacts and support in their struggle against fierce homophobia in this last dictatorship in Eastern Europe."